William Blount, senator from Tennessee; charges dismissed for want of jurisdiction, Jan. 14, 1799. Harry E. Claiborne, judge of the U.S. District Court for the district of Nevada; removed from office Oct. 9, 1986. Alcee L. Hastings, judge of the U.S. District Court for the southern district of Florida; removed from office Oct. 20, 1989. Walter L. Nixon, judge of the Southern District Court for Mississippi; removed from office Nov. 3, 1989. William J. Clinton, president of the United States; acquitted Feb. 12, 1999. G. Thomas Porteous Jr., judge of the U.S. District Court in Louisiana removed from office Dec. 9, 2010. Information Please® Database, © 2012 Pearson Education, Inc. All rights reserved. 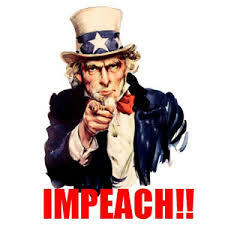 It is with a heavy heart that we tender these Articles of Impeachment against all living Democrat federal political office holders, the Democrat Party and the Democrat National Committee (DNC), knowing full well that millions of fine, upstanding American Democrats are honest, fair, patriotic and compassionate. Sadly, very clever charlatans have duped them, as they shall see. Democrat federal political office holders, the Democrat Party and the Democrat National Committed have acted against the best interests of a free, prosperous and sovereign America and have exploited human weakness for their own political and financial gain. For the last 100 plus years, under the seriously flawed Progressive ideology, they have undermined and subverted the Founder’s literal meaning of the U. S. Constitution and have knowingly and with malice turned free American citizens of their respective states into “subjects” of the U. S. Government and have systematically, over time, robbed them of their individual freedoms. Americans are no longer a SOVEREIGN people of the individual states. Thanks to Democrats and the Progressive ideology, Americans have become indentured bondservants to a powerful, almost tyrannical, central government that has wrapped the people in chains with millions of unconstitutional laws and rules and spent them into bankruptcy. Unfortunately, most Americans are totally oblivious to their plight. The evidence is clear. The Democrat groups and entities we have named here have covertly and overtly engaged in corruption, collusion and racketeering for the sole purpose of gaining and maintaining perpetual political and financial power in the United States and must be held accountable. This in no way absolves Republican federal political office holders, the Republican Party and the Republican National Committed for committing similar acts.